Former Air Force Academy cadets who came forward to say they had been raped. From left: Jessica Brakey, Sharon Fullilove, Kira Mountjoy-Pepka, and Beth Davis. Photograph by Harry Benson. After Beth Davis told the U.S. Air Force Academy she’d been raped by another cadet, she was punished. But she and her classmates Lisa Ballas and Jessica Brakey, who’d also reported sexual assaults, decided to fight the system. The air force is reeling from what they exposed: a covert war against its women. Vandenberg Hall and other white, monolithic shapes in the academy’s gargantuan geometry, the scale designed to make the individual feel subordinate to the institution at all hours, from reveille to taps. 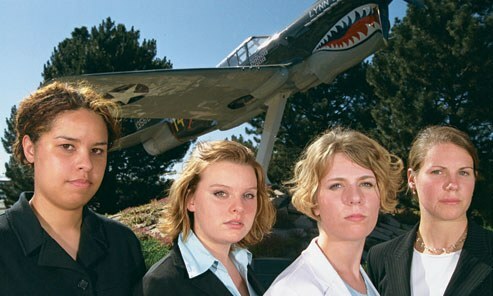 Be the first to comment on "Air Force Academy’s War on Women"